I always wanted to marry an orphan. Little did I know, so did my wife. We both had the same motive for wanting to marry an orphan. Neither one of us wanted to be obligated to spend holidays with another family. Amanda and I have been married for nearly seven years and I think there are times when we both still wish we had married an orphan. My wife grew up in St. Louis, which is approximately 250 miles from where we now live. Therefore, when we travel down to St. Louis, we are in the car for at least 4 hours each way. Throughout most of the trip the only thing you see are corn fields, and the occasional truck stop. Going to family functions in St. Louis is quite different than the ones to which I am accustomed. Each of Amanda’s parents are one of eight children. Therefore, there are dozens of aunts, uncles, and cousins. I love my in-laws very much. They are both very giving people. In the dictionary next to “hospitality” are pictures of Amanda’s parents, Dan and Judith. At each major holiday they invite everyone over. There are usually 40-50 people at every gathering. I believe the first holiday that I spent with Amanda’s family was Easter. I was shell-shocked to be with so many people under one roof. This is because while I was growing up my family gatherings were much smaller. However, I have grown used to these large gatherings. I enjoy playing games, eating, and just spending time with everyone. However, for an introvert like me, these events do sap my energy. Amanda’s first introduction to my family was at my 34th birthday party. I think for her, it was hard to adjust to being with such a small group, where more attention was focused on her. She was no longer able to blend into the woodwork. This Easter we will be spending time in St. Louis. I just wish one of us had our pilot’s license so that we could fly down. It would enable us to visit more often. Amanda gave up a lot when she moved to the barren wasteland that is Northwest Illinois. I know that she misses seeing her family. However, I am glad that we met, because she is the perfect woman for me. She is a kind and loving woman. I am glad that we both were willing to expand our horizons. We both come from great families. It has been fun getting to know Amanda’s clan. Amanda’s dad is a great storyteller, and her mom makes some of the best cookies I have ever tasted. I am thankful that I did not marry an orphan because I would have missed out on the love Amanda has shown me. I too would have missed out on becoming part of a great family. I think it is safe to say that most, if not all of us feel down at times. What do you do when you feel like this? I have to be honest, there have been many times when I have felt despair. This despair is something that has made me feel alone. I have been afraid to share my true feelings, even with those closest to me. Some of this has been brought about by my feelings of inferiority, which I have touched upon in previous posts. I often feel as if I am not good enough for anything or anyone. These feelings often lead me to doubt myself in almost every facet of life. Many days I go to work worrying that I am going to “screw up” or forget to do something. I believe one of the things that has fueled these feelings of insecurity is that others have often “talked down” to me as if I am too stupid to communicate just like anyone other person. My legs don’t work correctly, but my brain functions pretty well. Just don’t ask me to do math! This doubt can be paralyzing. Fortunately, I have reached out to others who have helped me begin to see myself in a more positive light. Counseling has shown me that I do have things I can contribute to society. It has been a positive experience sharing my doubts and insecurities in a therapeutic setting. Writing this blog has also been a cathartic experience, as it has helped me unleash some of the “demons” that rule my thoughts. Likewise, the power of prayer has also been very instrumental in helping me get over some of these irrational fears. I must be honest there have been many times that I have lashed out at God for “placing” me in this body. Humor is always good medicine as well. I have learned over the years that you have to laugh at the circumstances of life. This helps one move past the bad and appreciate the good things that life has to offer. I wish I could go back and tell my younger self to shut out the negative thoughts and focus only on the good. That is a lesson that I am just now learning as a 42 year old man. Finally, it is important to keep active. Now that the weather here in Illinois is getting warmer, I will be outside cycling away my blues. Today is National Siblings Day in the United States. This unofficial holiday is also celebrated in other parts of the world. I am thankful for my two older brothers, Cory and Shannon. Over the years they have put up with a lot having me as their brother. For instance, there were many times they were sent to stay with relatives as my parents and I made our way to yet another hospital visit. I am not really sure they minded this all that much. They were certainly spoiled by my grandparents, or my aunts and uncles whenever they were exiled to stay with family. However, I really wonder how it was for them when they were younger. I would assume it was difficult having to be uprooted from their normal routine. I know that it would have been for me. Growing up I was always closest to my oldest brother Shannon. My other brother Cory used to pick on me quite a bit, which, as I look back on things, was quite normal. Now that we are all grown and have our own families, I respect the men my brothers have become. They both have married great women and have fathered some very good kids. I wish I could see my brother Shannon and his family more often, but they live in New Jersey. It would be fun to spend more time with his family. He does still watch out for me, even though we are hundreds of miles apart. My brother Cory still looks out for me as well, helping my wife Amanda and I do things around the house. He is always willing to lend a helping hand. I love both of my brothers very much. I even forgive them for all of those times we were in the car and they’d pick on me. I would then get in trouble for being a whiner. I should have learned that sitting in the middle of the backseat made me a good target. I maybe could have asked to ride in the trunk instead! Anyway, if you haven’t done so already, reach out to your siblings and tell them how much you appreciate them. For today’s post I am hoping to get a little interactive with those of you who read my blog. When I was younger I was a fan of the the television show Late Night with David Letterman. You never knew just exactly what you were going to see, especially when Bill Murray was a guest, or when David would go out and interview random people on the streets of New York City. One of the nightly segments that he would do was called the “Top Ten” list. These lists would usually be centered on some absurd topic such as “The Top 10 Ways the Country Would be Different if Britney Spears Were President,” or “The Top Ten Things Mick Jagger Learned After 50 Years of Rock and Roll.” These lists, as you can imagine, would be filled with all kinds of bizarre things. Leave me a comment and let me know what your own list would look like. My family went on exactly three vacations as I was growing up. One was to the Ramada Inn that was just across the river from the town in which we lived. This is what is called a “staycation.” today. You might think this was less than spectacular, but it was actually quite memorable. During our weekend stay at the Ramada Inn, the main activity on our agenda was swimming, at least for my brothers and I. Despite the fact that we were less than 20 minutes from home we had a lot of fun. It was during this weekend of swimming, swimming, and more swimming that I had one of my first tastes of powdered donuts. My love affair with donuts began at that Ramada Inn. The hotel is still there, but it has changed hands from one franchise to another several times over the years. Despite this, I can still taste those powdery rings every time I pass by that building. I can also smell the chlorine of the pool. It was a “staycation” that had stuck with me over the years. The second trip my family went on was to Six Flags Great America in Gurnee, Illinois. The memories of this trip are a bit more hazy. However, I believe my dad lost his glasses on one of the water rides. I am not sure what it is with Bradshaw men losing their glasses in water, but it does seem to be a trend (see “Patience” – Part 2). While at Great America I also met Bugs Bunny and Yosemite Sam, which was kind of surreal. I had only ever seen these characters in television cartoons. But there they were in living color. Plus they were much, much larger in real life, which was confusing to the mind of a little boy. To this day I despise amusement parks. I am not sure if this hatred originated on this particular vacation, but it is a distinct possibility. 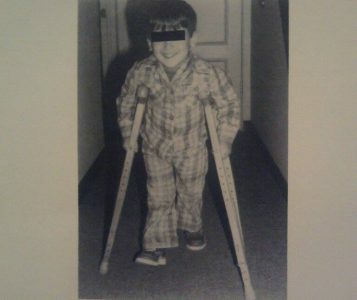 At this point in my young life I was still getting around by pushing a walker. While at an amusement park this is no easy task. There are uneven surfaces everywhere, and thousands of people through which to navigate. To make matters worse there were no powdered donuts to be seen anywhere! Our final trip as a family was to Rapid City, South Dakota, along with a fewer smaller towns in Minnesota. My dad was a fan of Westerns starring Clint Eastwood and John Wayne, and he enjoyed tales of the Wild West. Therefore, we visited several places on this trip where outlaws committed their notorious crimes. One such place was Northfield, Minnesota. This small town is the site of a raid by the James-Younger Gang on the First National Bank of Northfield, which occurred on September 7, 1876. The James-Younger Gang was comprised of Jesse and Frank James, along with Bob, Cole, Jim Younger, and a few other less notorious men. This robbery was thwarted by employees of the bank, and all members of the gang were either killed or wounded. Jesse and Frank were the only members of the gang to make a successful escape. It was fascinating to go inside the bank where this infamous event took place. While in South Dakota we visited several tourist traps, such as the Corn Palace. This concert venue/arena is located in Mitchell, South Dakota and is decorated on the outside with murals made entirely out of corn. We also stopped at Wall Drug, which is basically a shopping mall with all kinds of knickknacks related to the Wild West. Almost as soon as you enter South Dakota you see signs encouraging you to visit Wall Drug, which you should if you are ever in this part of the country. Order yourself a bison burger and an ice-cold glass of water. On a hot day, there is nothing like a cold, refreshing glass of the water at Wall Drug! We also traveled through the Badlands and the Black Hills. South Dakota is full of natural beautiful. It is also home to Mt. Rushmore a national memorial featuring a massive sculpture that depicts four of America’s greatest presidents: George Washington, Thomas Jefferson, Theodore Roosevelt, and Abraham Lincoln. The faces of these men were carved into Mount Rushmore between 1927 to 1941. It is an awe-inspiring place to visit, especially on a day when the skies are brilliant shade of blue, as they were the day we visited. The enormity of the sculpture is rather breathtaking. I think one of the best parts of this vacation was that it was one where my dad enjoyed seeing things he had only ever read about or seen depicted in movies. We also got to visit Ellsworth Air Force Base, which is home to the B1 bomber, an aircraft that played an important role during the Cold War with the Soviet Union. Many memories were made on this trip, which made it all the more special. For, little did we know at the time, these would be some of the last memories that we’d create with my dad. It was nearly a year later that he found out that he was dying of leukemia. This disease would take his life within a year. Take the time to make memories with your family. Time is precious and life is very fragile. My dad with his 1940 Chevy coupe. Have you ever had someone make you feel small or insignificant? I feel like this has happened to me quite a few times in life. There are times when people are afraid to address me. I am not sure if this is because I look different, or they think I am incapable of answering for myself. When this occurs, I feel less than human. Perhaps there is no better illustration of what I am talking about than when I worked as a high school guidance counselor. In May of 2012, I received my master’s degree in school counseling and I was eager to find a job where I thought I could make an impact on the lives of students. Just before receiving my master’s I did a year-long practicum at a local middle school. I enjoyed working with kids this age, as I felt like I could relate to them. When I was in junior high my father had just died, I felt like a freak due to my disability, and I was afraid to talk to most people. I think it is fairly common for most kids this age to have insecurities. Therefore, I felt right at home mentoring these students and helping them to navigate social and emotional issues. However, the year ended quickly and it was time to move on to other work. So, with my master’s degree complete I set off to find a job within my chosen field. Dozens and dozens of job applications were completed, and there were a few job interviews along the way. However, it was two months before I was offered a job. Without many other options I felt as if I had to take this job, as I was about to get married and I wanted to be employed before the wedding. So, I took a job at a small high school with a student body of nearly 300 students. In hindsight this was probably not the best decision that I could have made, however, I learned some things about myself through this job. Just weeks before my wedding I moved all of my books, and other belongings into my new office at the high school where I’d be setting off on this new adventure of being a guidance counselor. Little did I know that it would also be the beginning of five very stressful years of life. This was due to several factors. To begin, the principal that I worked under my first year seemed to have some issues relating to the staff. The building that I worked in seemed very divided. There were those that liked the principal and those that despised him. Oftentimes, I was caught in the crossfire. There were times when I was approached by staff members to make decisions that only a school administrator should be making. I also felt like kids were being sent to me for disciplinary reasons, which again the principal should have been handling. I began to get a sense that something was wrong with my boss. He was not just a poor administrator, there seemed to be something wrong with his mind. Sadly, this would turn out to be true, as he retired before my second year. He then died just a few years after of Alzheimer’s disease. He was a kind and honorable man who gave me my first job as a counselor. For that, I will forever be grateful. He also encouraged me along the way that first year, which meant a lot to me. Things would change quite dramatically the next year. The school board hired a man who had been a police officer at one point in his career. He then decided to get into education and had served for several years as a vice-principal at another area high school. From the very start I sensed that things would be different with this man. He was much more of a leader. He also had a strong work ethic. Furthermore, he was a man that did a lot of good for the school. However, he also had a way of making others feel small. Growing up I always had insecurities about myself. I never felt like I was good enough for anyone or anything. Some of these feelings I still harbor today. My new boss deepened these insecurities. He did this by making me feel like there was only one way to do things, and that was “his way.” This began to paralyze me in an emotional way. It made me question every decision that I made. I would often ask myself questions like, “is this the way he would do it?” This made going to work each day a living hell. I felt like I was always under a microscope. Being micromanaged when you feel as if you already don’t measure up to an impossible standard is horrifying. Many sleepless nights were spent worrying about going to work the next day. Would I be called into the bosses’ office for doing something “incorrectly?” Would I be criticized for handling a situation “poorly?” It seemed like a never ending cycle of not being good enough. I felt smaller than I have ever felt in my life. After four years, with the support of my loving wife, I turned in my resignation letter. On the day that I did this, my boss asked me if there was something he did to cause me to leave. I glossed over the situation and told him that the job was just too stressful and that I needed to leave. I wish I would have had the courage to tell him how he had made me feel for those four years that I worked under him. I was the only counselor at this high school. I was responsible for helping students not only socially and emotionally, but I was also in charge of insuring that certain special educational plans that had been put in place for several students were followed. I was also responsible for creating class schedules for each student every year. This alone occupied most of my time from early December through June of each year. Likewise, it was my responsibility to oversee that every student throughout the district who was classified as homeless was provided certain accommodations. I was also expected to be at every IEP meeting for every special education student in my building. There simply was not enough time to do everything that was expected of me, let alone worry about whether or not I was doing things “the correct way.” One conversation that I had with my boss that will always stick with me is one in which he told me, “I always do things the correct way.” The arrogance in these words shocked me. They also were certainly not true. For, he did not treat his staff with the respect that they deserved. The year that I resigned, there were 6 other staff members that left as well. It makes me wonder if they felt as small as I did when I left that school. Recently I took one of those DNA tests. The kind where you spit into a vial, seal it all up in a bag, and ship it to a lab in Utah. I did this because I was curious to find out my ancestral roots. For the most part, the results were not a surprise. I knew I had roots in the United Kingdom, Germany, and Italy. However, I was surprised to see that I also had traces of French, Swedish, and Russian blood. Seeing all of these percentages laid out like this made me yearn to know the stories of my ancestors. What were there lives like? What kinds of personalities did they have? Where did they stand politically? These are all questions that I will never will be able to answer. However, I would love to do a little more research into who some of these people were. I know that much of my mother’s family were Germans who came to the U.S. and settled in rural parts of Pennsylvania. I am sure many of them were farmers who tried to make a better life for their children. Fortunately, many of them came before Europe was torn apart by war. I would like to go back and hear their stories. It would be fascinating to learn why they decided to leave behind loved ones to come to a new country. This to me would have been terrifying. My maternal grandparents Lauren and Betty Geil were both great people. I did not know my grandfather very well, as I was quite young when he died. But I do have memories of him. My grandmother Betty, was perhaps the coolest grandmother there ever was. I can remember her doing the “Moonwalk” after Michael Jackson made it famous. She was also one of the most giving people that I have ever known. On my father’s side things are a little more ethnically diverse. I have been able to research the Bradshaw family back to the 1600’s. It appears many of them came from Lancashire, a county in the northwest of England. The Bradshaw line that I am from first settled in Virginia, where it appears they were quite successful farmers, as census records show many of them had quite a bit of land, and a few even owned slaves. The Bradshaw family began to spread out through the Carolinas, Tennessee, and then into Illinois. My great grandparents Shannon and Etna Bradshaw on the far left. I believe the other men in this picture might be Shannon’s brothers with their families. A few summers ago my wife Amanda and I visited a cemetery just outside of White Hall, Illinois where several of my distant relatives are buried, including my great, great grandfather. I wish they could have all spoken from beyond the grave to tell me what their lives were like. There is a place near White Hall called Bradshaw Mound. I’d like to find out the history of this place. It makes me wish that I’d have asked my grandfather these questions before he passed away several years ago. He was born in White Hall and maybe he could have filled me in on the history of the town where many of my distant relatives lived. My fraternal grandmother was born and raised on the outskirts of Shaw, Mississippi. She grew up on a farm where her and her siblings picked cotton, that is until my great-grandmother passed away. After this event, my grandmother took over as caretaker of the family. She did the cooking, cleaning, and other chores that her mother once did. This means that my grandmother was also unable to finish school. However, she was a woman who knew how to take care of her family. Growing up I loved hearing the names of her brothers and sisters, many of whom had been born in Italy before my great-grandparents Vincenzo and Palmina Bastari came to America. My grandmother’s brothers names were Rigo, Tilio, Aldo, Amilio, Cerro, and Sam. My grandmother’s name was Mary, and her sisters were Edith, Emma, Jenny, and Clara. I never had the opportunity to meet my great uncles, but I am sure they all had great stories to tell about growing up in Mississippi. I can also imagine their lives, especially as they were growing up, were very difficult. However, they all went on to have their own families and lived full lives. I did have the privilege of meeting all but one of my great aunts and they were all feisty women. They also were all quite beautiful. Each one of them maintained part of their Italian accents as well. My grandmother’s accent was unique. It was part Mississippi and part Italian. Her family was from the town of Assisi, which is in central Italy. Hopefully, I’ll make it there someday. I am sure there are still some long-lost cousins who live there. My dad’s parents, Oris and Mary were married in 1940 in Hernando, Mississippi. They lived for a time in Memphis, Tennessee before moving north to Rock Falls, Illinois. I think it was hard for them to move away from Memphis, but my grandfather came north to help his father and mother. My grandfather was one of the most selfless men that I have ever met. He always put family ahead of himself. He gave up a career with the Walgreen’s Company so that he could take better care of his children once his first wife died. He then remarried, moved to Illinois and did various jobs to support his family. He was a Coke delivery man, and then towards the end of his working life, he was a custodian at the high school just down the street from where I live now. I miss him every day. When my own father passed away I was just a boy. My grandpa always made sure we were all right. We all knew we could talk to him, as he was very patient and kind. He was also full of wisdom. He taught me the importance of staying connected to your family. Family always has been, and always will be important to me. Take time to learn your family’s history. Some things may be ugly, but I am sure you’ll also find some incredible things as well. I appreciate the things that I have learned about mine.